Because the “War on Poverty” failed. What to do? First of all, I learned this from President Johnson’s failure: It’s better to exercise your own freedom to help others than to yield that responsibility to the government. It will redistribute your hard-earned money in ways with which you might disagree. We now have more than 50 years of evidence, as proof of that. Almost anyone can make a difference in the lives of poor Americans, just by donating locally. Give your used clothes and other items directly to people in need. If you have ability or resources, you can help however and wherever you choose, because poor people are everywhere. What really matters, is to help your neighbors. México is also our neighbor, and we founded Miracle Airlift because we are positioned to work there effectively. Our work helps people in two ways: 1) Some projects relieve poverty through vocational training, which leads to better employment and more income. 2) Other projects work by relieving the effects of poverty. Both are important, because painful effects can hurt people to the point of desperation. This may ultimately result in immigration to the U.S., legal or not. When people can improve their lives enough to feel comfort in their homes, however humble, their feelings of desperation fade and the pressure to emigrate is abated. 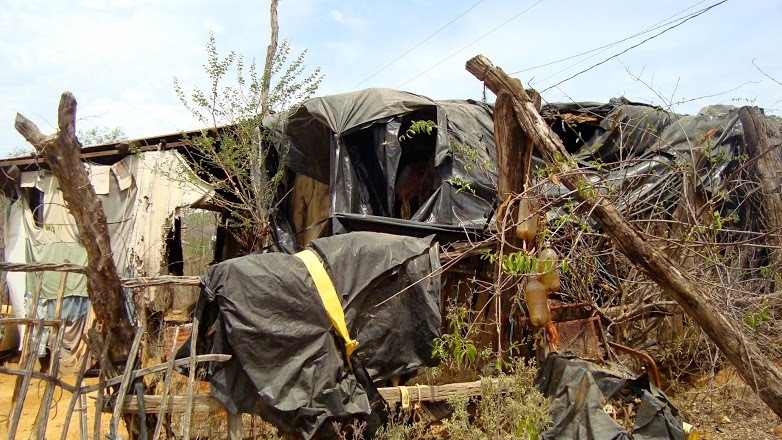 Here’s an example of the effects concept: In a tiny and impoverished community, families are living in shacks of used cardboard and plywood. The rainy season is wetter than usual, and the roofs are so porous that these poor people don’t even have a dry bed. A team of volunteers arrive in a pickup truck stacked high with used plastic fabric, very strong, and printed with old billboard ads. In México, everything from billboard fabric to cheap paint tarps are called “lonas”. For our purpose, the most important characteristic of “lonas” is that they’re waterproof. Hours later, every shack has a leak-free roof. Poverty remains, but one of its painful effects is gone. Mexicans themselves came up with this idea. They group together and do voluntary community work which can help every family in the neighborhood. The list of self-help possibilities is endless. They don’t try to fix what they can’t, they work to improve what they can, and that makes their lives a little better by relieving some of the pain. It puts them on higher moral ground and is inspiring to see: “many hands make light work.” Miracle Airlift steps up “to help the helpers” by providing aid in the form of materials and technical assistance needed to reinforce their efforts. This elevates the whole process to a new level. They see improvements resulting from their own efforts, and are encouraged by the realization that better things are possible, for their home and country.